Ahmedabad or Amdavad as Gujaratis love to call it, is a city that paints a pretty picture of fun, frolic, colours of the chaniya cholis and the taste of gathiyas and undhiyu. It is the first in the world to be declared a World Heritage City by UNESCO. 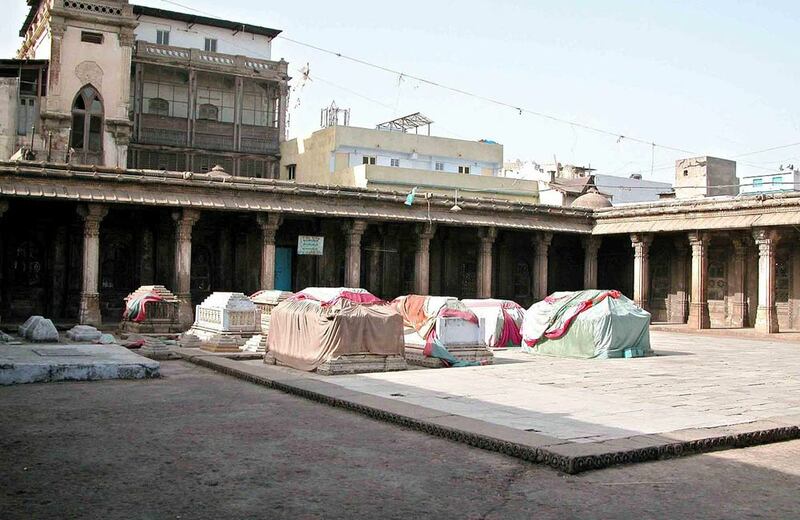 Ahmedabad has undergone continuous change since the time it was conceptualised and founded by Sultan Ahmed Shah. But, all through these years, something that has stayed constant is the love of the city for celebrating life, and preserving its heritage through its architectural wonders. These wonders are now the pride of the city and are some of the top tourist attractions of Gujarat. Apart from these, there are several parks and water tanks in the city that are worthy of a visit. 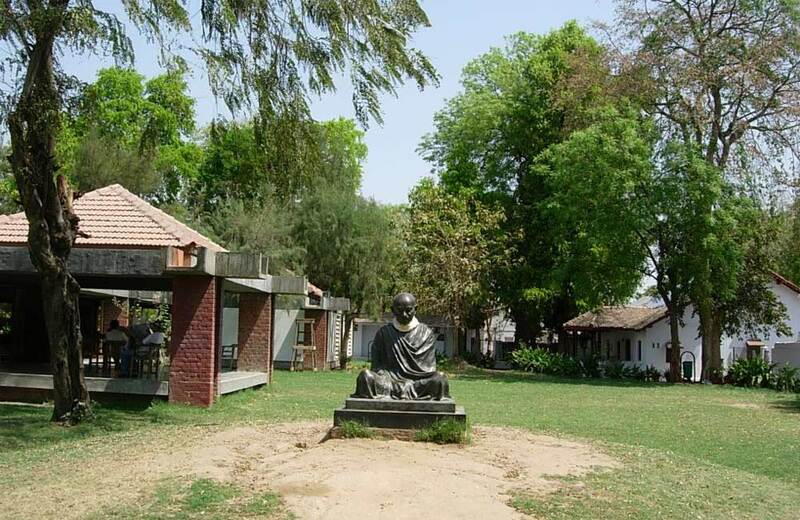 The very first name that pops into the mind at the mention of Ahmedabad is that of Mahatma Gandhi and Sabarmati Ashram. Once home to Bapu and being the centre of operations for the Indian freedom struggle, it is located on the banks of river Sabarmati. This place gives visitors an insight into the life and struggles of Mahatma Gandhi. You can see many of his personal artefacts, including his glasses, slippers, and books. There is an art gallery and a library with almost thirty-five thousand books in English, Hindi, and Gujarati here. The literature, paintings and the artefacts here are a treasure trove if one wants to learn more about the life, family, and revolutionary ways of Gandhi. Sabarmati Ashram holds the honour of being the starting point of the iconic Dandi March, which was a key point in the Indian freedom struggle. 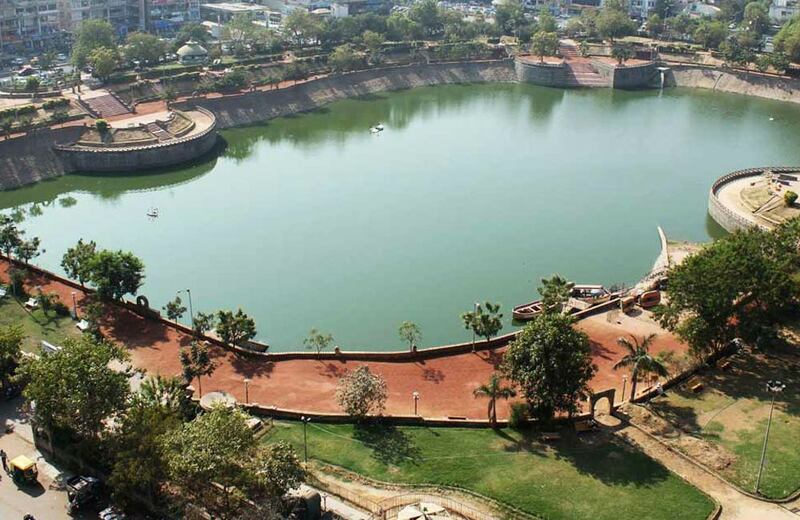 It was in 1411 that the founder of the city of Ahmedabad, Sultan Ahmad Shah built Bhadra Fort. A popular tourist attraction now, the forts holds many stories within its walls. It houses a temple called, Bhadra Kali Temple, which gave the fort its name. Legends tell the story of Goddess Lakshmi once entering this fort to shower her blessing on the Muslim Sultan that the city will always be blessed with wealth. 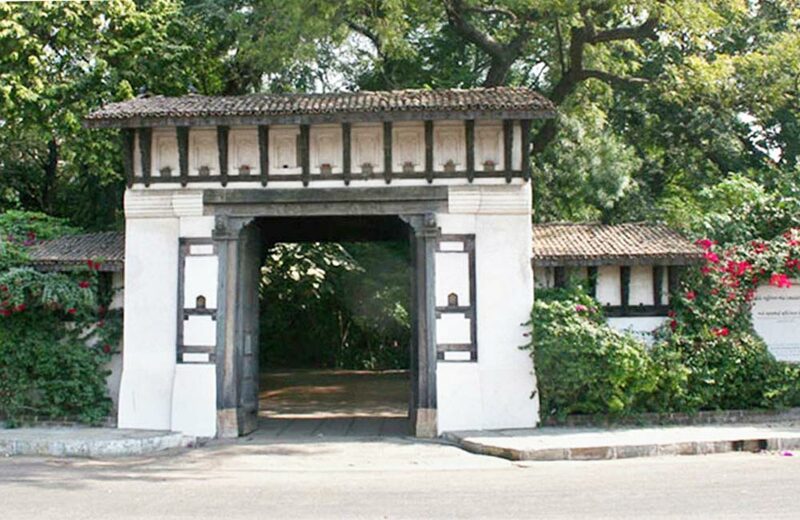 The majestic fort has a grand courtyard with lush green lawns and several palaces. 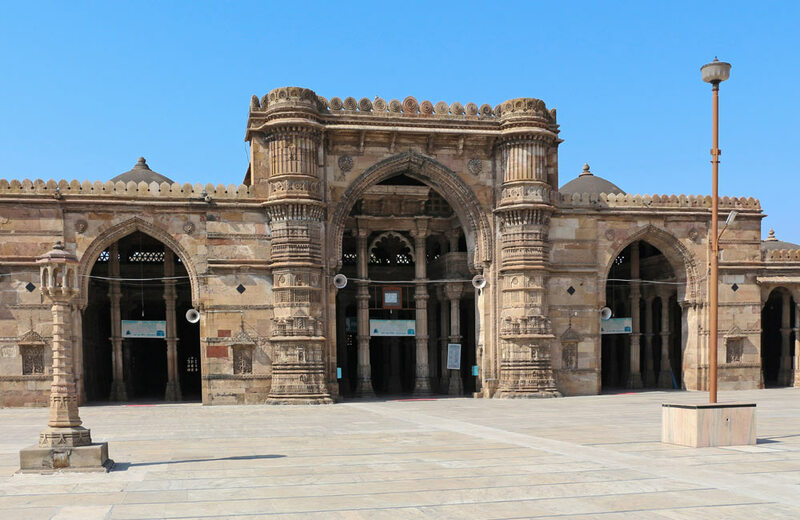 Another architectural wonder created by Sultan Ahmed Shah, Jama Masjid is a top tourist place in Ahmedabad. 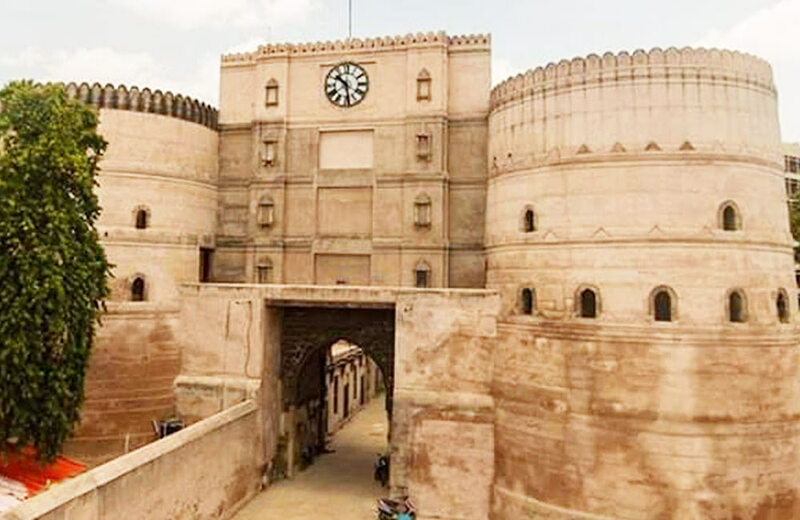 The fort was built in the year 1423 by the Sultan, who wanted the Muslims of Ahmedabad to have a place where they could gather for their Friday prayers. Located right next to Bhadra Fort, it matches its grandeur with its yellow sandstone and two hundred and sixty pillars with fine carvings. The architecture of the mosque presents an amalgamation of Hindu and Islamic architectural styles, and it is said that the yellow sandstone used in the mosque was once part of some Hindu and Jain temples. 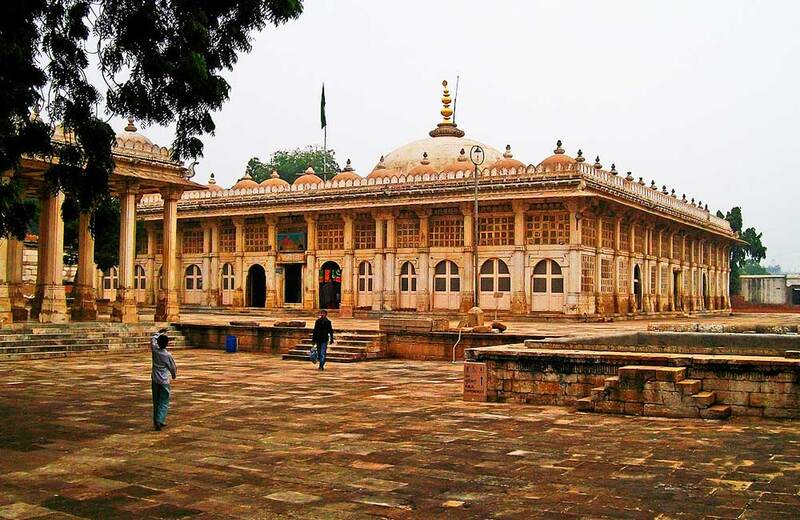 A group of tombs and pillars make up the beautiful complex of Sarkhej Roza. Like most monuments in the city featuring Islamic architecture, this one too has some gorgeous latticework along with intricate carvings. Built around an artificial water body, called Sarkhej Lake, this tomb is among the architectural attractions of the city. While its brackets and pillars are Islamic elements, the majority of ornamental motifs are starkly Hindu influences. Ahmedabad is replete with tombs that enchant you with their magnificence and ornate carvings. 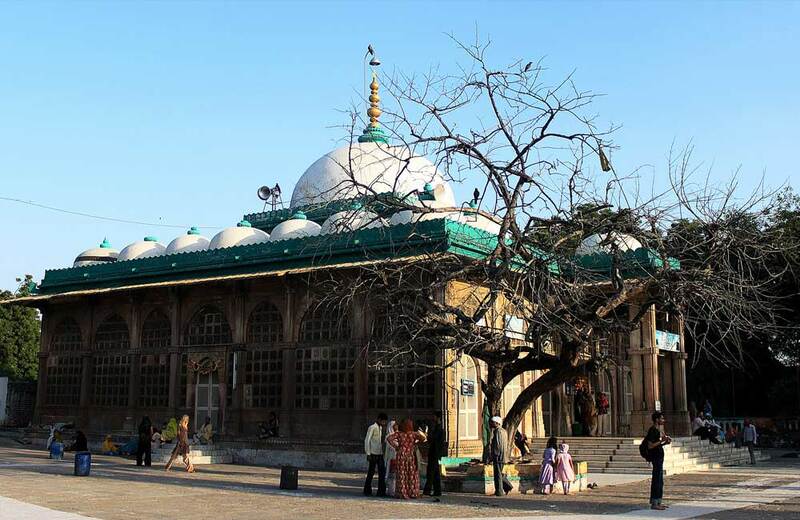 One such tomb that should be a part of any tourist’s itinerary is Shah-e-Alam’s Roza, also known as Rasulabad Dargah or Shah Alam no Rojo. This mausoleum is a famous Sufi shrine that draws devotees from far and wide. The dome of the tomb was once adorned with gold and precious stones that added to its grandeur. The tomb complex has a smaller mausoleum with twenty-four domes, which holds the graves of Shah Alam’s family. The floor of the tomb is done with an elegant pattern of with black and white marble and the door frames as well as the two stone pillars on both sides are made of intricately carved pure white marble. Rani no Hajiro, which means Queen’s Tomb in Gujarati, holds the graves of the queen consorts of Ahmed Shah. Away from the chaos of the city, tourists flock this place for the calm that marks the place, in complete contrast to its appearance which has been made quite lively with buntings added to the place by the squatters. The graves here, unlike at other tombs, are not in a closed hall but in an open courtyard. These richly carved mausoleums display a fine interlaying of mother of pearls, and their carvings boast a beautiful coming together of Jain, Hindu and Islamic aesthetic influences. One of the best places to spend your evenings in Ahmedabad is this man-made Vastrapur Lake, which is in the eponymous area of the city. It is a calming experience, spending leisurely hours on its shores, admiring the greenery all around. The open-air theatre here is host to several cultural shows round the year that you can attend for a glimpse into Gujarat’s colourful traditions. 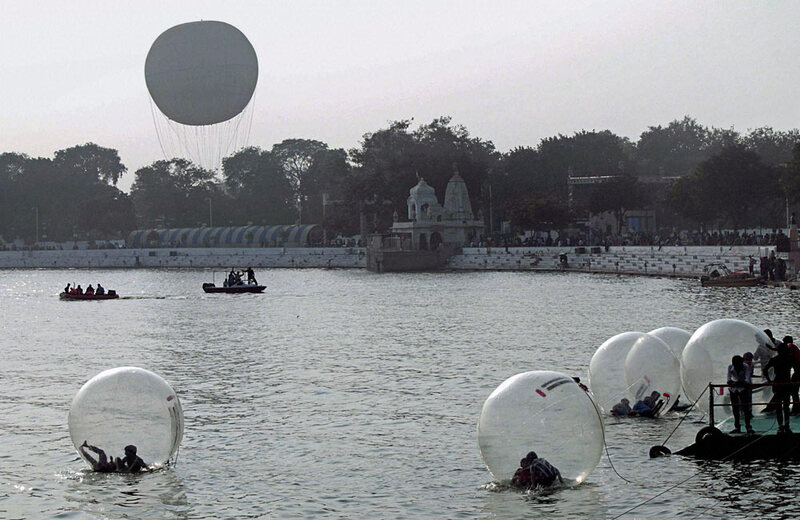 The largest waterbody in the city, Kankaria Lake has enticed the people of Ahmedabad and tourists flocking the city for many years now. Built in the fifteenth century by Sultans Muhammad Shah and Ahmed Shah II, it even had an in-built water purification system since it was the bathing place of most rulers of that era. An entertainment zone has now been developed on the lakeside, which has a zoo, kids’ city, toy trains, a water park with loads of rides, and food stalls. You can easily have a day picnic at this place, ending the day with a stroll along the lakefront. Enjoy your meals at Nagina Wadi, which is a garden themed food stall area lip-smacking authentic Gujarati food. 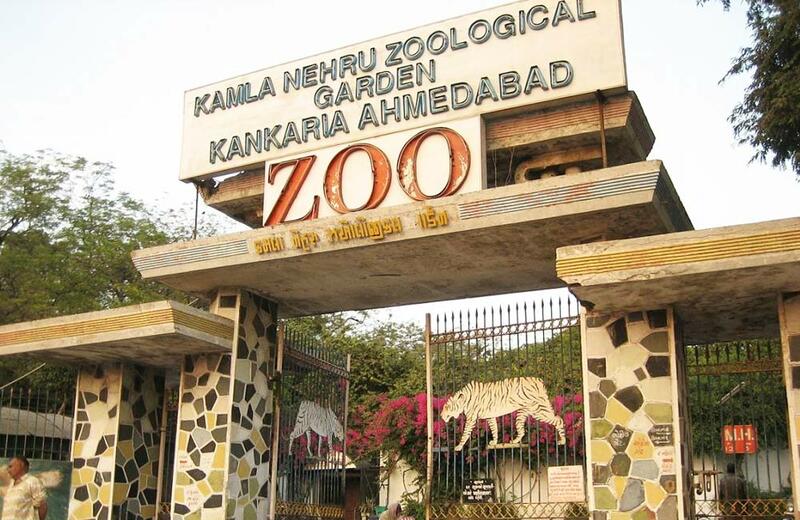 Kamala Nehru Zoological Garden or Kankaria Zoo as it also called is the perfect picnic spot in Ahmedabad. Kids love the place for its wide array of flora and fauna. Located on the banks of Kankaria Lake, the zoo was set up in 1951. It is a haven for wildlife lovers for you will find some rare and endangered species of birds, mammals, and reptiles. In 2017, the zoo opened up a nocturnal section, which houses animals like hyenas, jackals, and leopards; animals which are most active at night. The nocturnal zoo is one of its kind in Gujarat and as it uses light management to induce a night-like environment during the day, making these animals active. Soundproof enclosures keep the animals protected from the loud noise of visitors, but visitors outside can easily hear the animal and bird sounds through speakers. 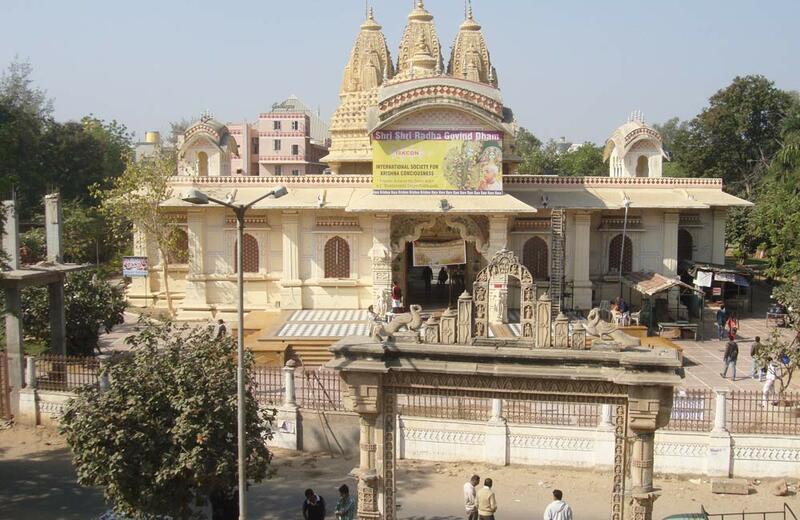 The fascinating exterior of ISKCON temple reflects a seamless mix of two styles: Gujarat Sompura and Rajasthani Khamira. The sprawling 4-acre campus holds the temple, manicured gardens, and beautiful fountains. ISKCON temple is primarily dedicated to Lord Krishna and Radha, but it also houses idols of other Hindu deities. Built around 1850, by a Jain Merchant, named Hutheesing Kesarsing, this temple adds to the rich cultural heritage of Ahmedabad. Made with marble and carved with extreme finesse, this exceptional work of art pays reverence to Dharmanath, who was the fifteenth Jain Tirthankara. The temple courtyard paved with marble has 52 cubicles that are the sanctum sanctorum for the various Tirthankaras. 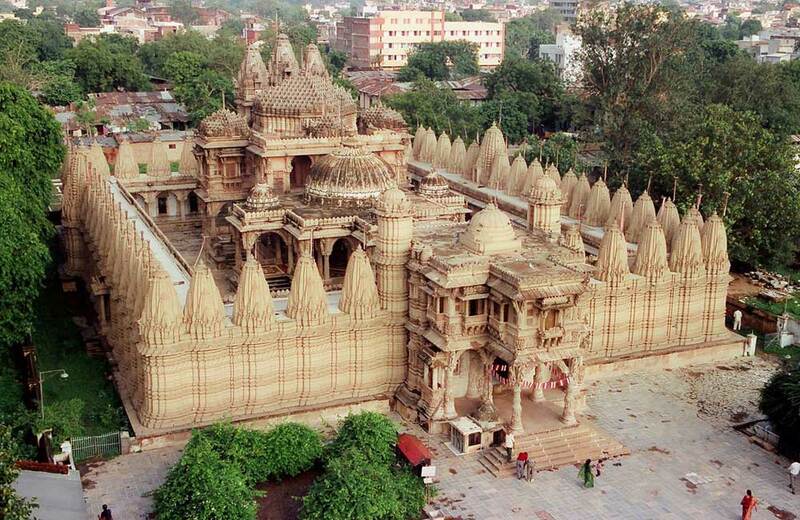 Tourists to the city of Ahmedabad are floored by the elegant and mesmerising architecture of Swaminarayan Temple. The pristine white exteriors are awe-inspiring and you cannot help but admire its fine craftsmanship. There are nine tombs here that are called ‘Nau Gaz Pir’ or the ‘Nine Yard Saints’. The temple is dedicated to Lord Narnarayan, but you will find idols of Hari Krishna Maharaj, Radhakrishna, and Dharmadev-Bhakti Mata as well in the premises. Food at the temple is cooked in satvik style and served hygienically. You cannot leave Ahmedabad without visiting its Pols. Many cities in Gujarat have pols but those in old Ahmedabad are one of the best. These are tightly packed rows and blocks of houses, with each house having one or two secret entrance or exits that only the owner would know about. The pols have derived their name from Sanskrit word Pratoli, which means a gate. Going inside the houses through one of these secret doorways would be quite a thrilling experience. With urbanisation taking over most cities now, these pols now house the cottage industry set-up of the city. Most pols used to have a temple at the centre and a platform in the courtyard for feeding birds. The architectural style of pols is a mix of many elements, with some having a Peshwa symbol at the entrance while another sporting a Persian-style grapevine carving on its facade. Standing right in the centre of the city, Sidi Saiyyed Mosque has an ethereal beauty that knows no bounds. 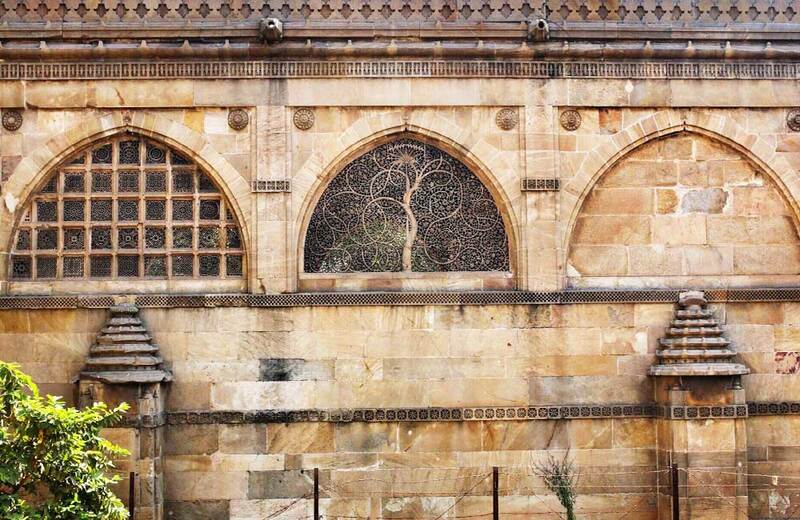 The latticework on yellow sandstone is the favourite of tourists and also among the most photographed monuments in all of Ahmedabad. Its craftsmanship will hold you spellbound when you see that every carving on it is flawless. These iconic jaalis have also been used in the logo of the Indian Institute of Management, Ahmedabad; such is their connection to the city. The history and the evolutionary journey of automobiles can be witnessed at this museum. 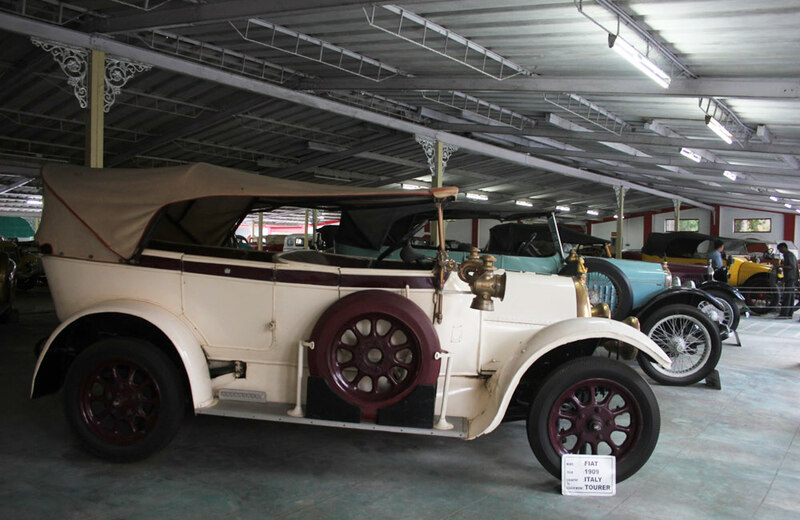 Right from horse-drawn carriages and railway saloons to spectacular convertibles, some grand vintage cars, and a gorgeous collection of vintage buggies, the museum is a visual delight for tourists. The cars exhibited here represent brands like Rolls-Royce, Buick-Cadillac, Daimler, Bentley, Chryslers and Mercedes. 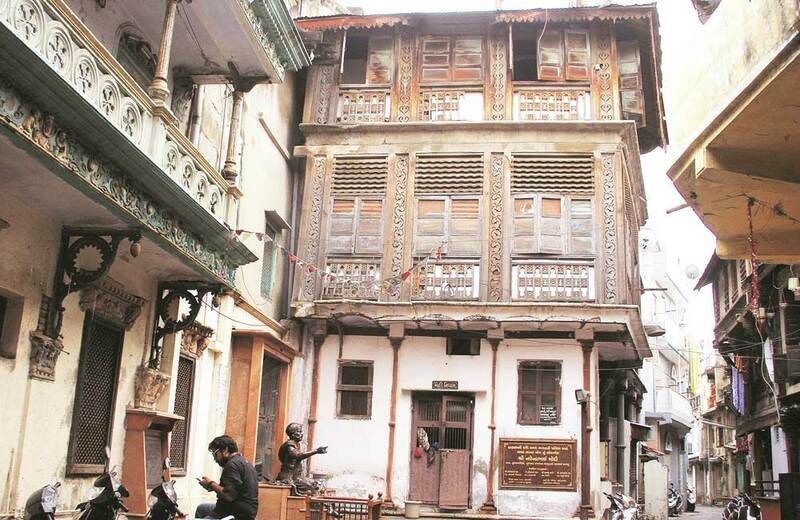 One of the oldest museums in Ahmedabad, it awe inspires tourists with its vast collection of rare textiles, fabrics, and artefacts from all over the country. A pashmina from Kashmir finds a place next to a tie-and-dye from Gujarat, giving you a glimpse of the lifestyle and culture that are visible in India. This science city presents scientific information to you in an interesting and entertaining manner. It is an initiative undertaken by the Gujarat government to develop an interest in people for science. 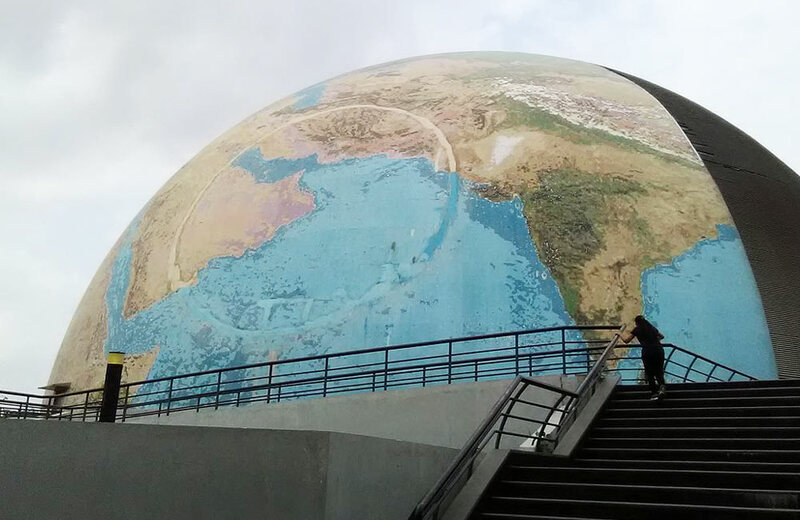 Exhibits that spark your imagination, virtual reality activity corners that keep you entertained and easy-to-understand demonstrations make this science city one of the best places to visit in Ahmedabad for kids and students. Gandhinagar, the capital of Gujarat, is well worth a visit from Ahmedabad. A large number of temples that are in the city like the Hanuman Temple and the Brahmani Temple lend an aura of divinity to Gandhinagar. There is a lot to do in the city like visiting the deer park, Sarita Udyan, and Children’s Park. 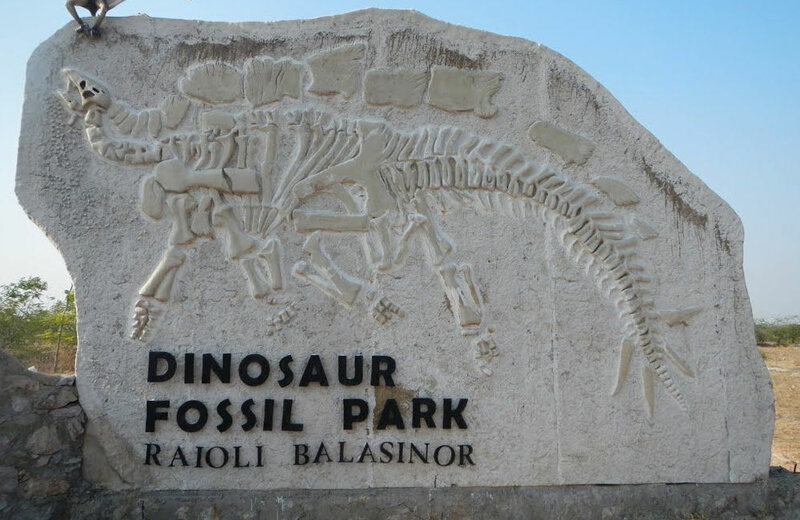 A must include in your things to do in Gandhinagar, is the Indroda Dinosaur and Fossil Park. It is one of the largest parks of its kind, including a botanical garden and an amphitheatre in its premises. The highlight of the park is the skeleton of giant mammals like the blue whales. 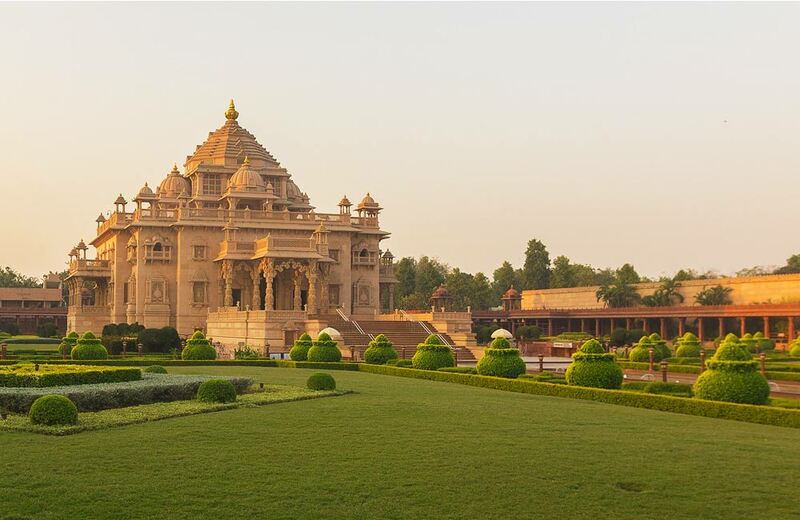 This temple holds the honour of being the most beautiful Akshardham temple of India, and rightly so. 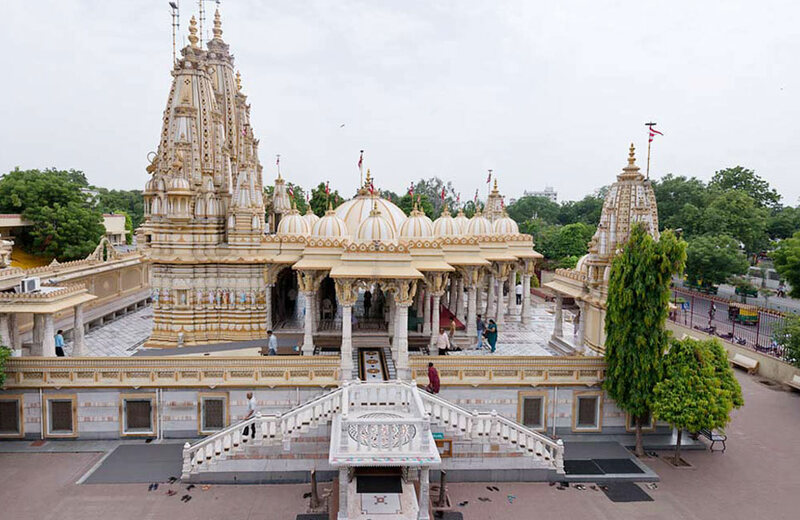 Almost two million devotees from all over Gujarat flock to this temple to pay homage to Lord Swaminarayan. The temple is a masterpiece when it comes to an amalgamation of contemporary style while keeping the essence of Hindu mythology alive in the architecture. The structure stands tall in the centre of the 23-acre lawns and has been built using six thousand tonnes of pink sandstone, without the use of steel. Inside the temple, 1.2-tonne gold-plated idol of Lord Swaminarayan is seated with the right hand of the idol raised in Abhay mudra. It is one of those places which offer you much more than the enlightenment that you seek in a temple. Mystic India, a film that takes you through the journey of an 11-year old child yogi called Neelkanth is educative and reflective. A light and music show called Sat Chit Anand Water show and audio-animatronics shows are also held at the temple, which is quite entertaining. Opening hours: 9:15 AM to 5:15 PM. Mondays closed. Step wells are quite a common sight in Gujarat, as they used to be the primary water source for the area before modern day plumbing rendered it out of use. The love of the people of Gujarat for colours and decoration is reflected in these step wells too. They are ornately carved and decorated just like the other architectural wonders in the area. Adalaj step well is the most famous of all the others in the city. It was constructed in 1499 by Rudabai, who was the wife of one of the prominent chieftains of the city. 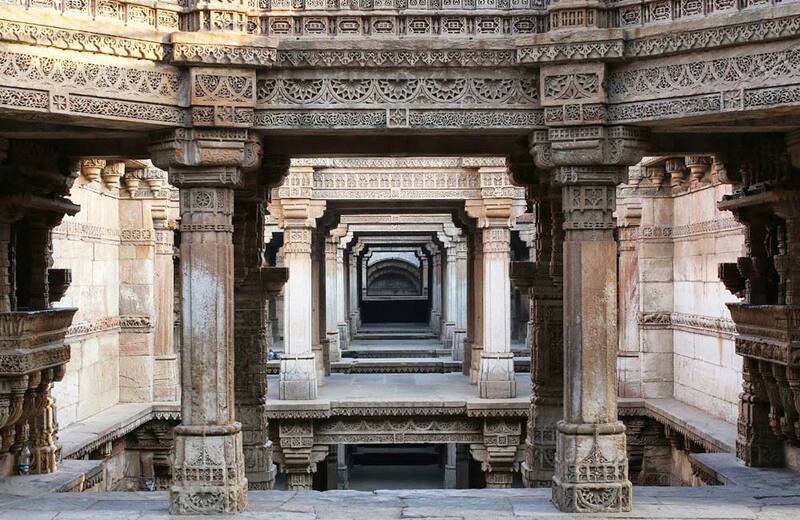 Each floor of the step well has intricately carved platforms and galleries that overlook the depth of the octagonal well. Hindu mythology has been vividly showcased through the carving of deities on the pillars on each floor. The shafts of the well are adorned with floral and geometric motifs which are interlaced with figurines that amplify the beauty of the well. The pavilions are lit with diffused lighting in the evening, which adds an intriguing look to the step well. The step well speaks highly of the fine craftsmanship and the architectural brilliance employed in its designing. Special mention: The annual Water Festival in Adalaj-Ni-Vav, which is organized every year in November. The weeklong festival celebrates The World Heritage Week. This bird sanctuary is one of the largest bird sanctuaries of the country and though it stretches a little over our fifty-kilometre criteria, it is worth including in this list. Covering an area of almost 115 sq km, the sanctuary is home to several exotic species of the aviary world. 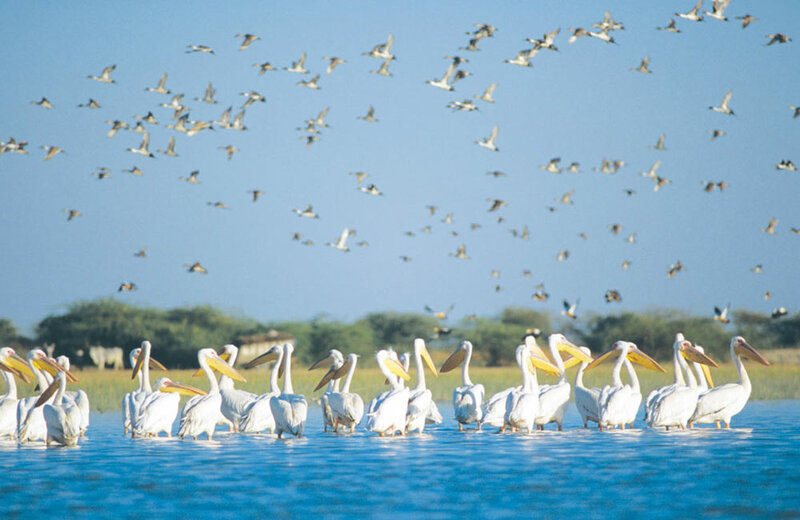 Presence of Nal lake and marshy land in the area attracts more than two hundred kinds of waterfowl like geese, pelicans, flamingos, cranes, spoonbills, storks, and ibis. Migratory birds like the bluish-grey hued demoiselle crane from Siberia are sighted here easily in winters. Several other major attractions await you if you venture a little further from Ahmedabad, like the villages of Anand and Modhera, both at a distance of 74 km from Ahmedabad.